THE CROWN PALAIS NEW HANKYU KOCHI is located 5 minutes away from Kochi station by a car. both business and sightseeing. All rooms are equipped Free Wi-Fi. 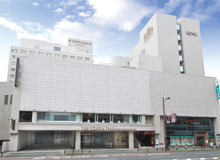 THE CROWN PALAIS NEW HANKYU KOCHI is located 5 minutes away from Kochi station by a car. It is close to Kochi castle and a prefectural office building so that it is good for both business and sightseeing. All rooms are equipped Free Wi-Fi. © 2019 The Crown Palais New Hankyu Kochi All rights reserved.